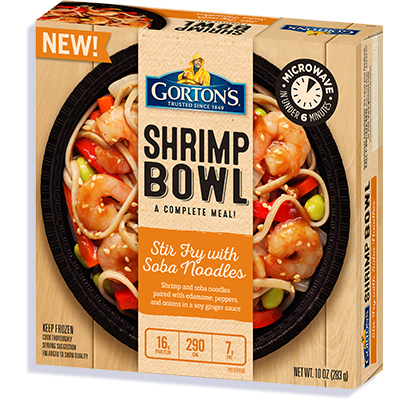 Shrimp + soba noodles + veggies = an irresistible all-in-one bowl. It doesn’t get much better than Shrimp, soba noodles, perfectly seasoned veggies and a delicious soy ginger sauce. Except when it’s all in one bowl and ready in under six minutes. REMOVE bowl from box. CUT 1-inch slit in film to vent. Place bowl on baking pan. Bake for 55 to 60 minutes*. Remove film and STIR halfway through cooking. Cooked Soba Noodle (water, buckwheat flour, semolina [milled wheat]), Shrimp (Shrimp, salt, sodium di-, tri-, and polyphosphate [to retain moisture], sodium bisulfite and sodium citrate [preservatives]), water, red bell pepper, carrots, edamame (soybeans), onions, soy sauce (water, wheat, soybeans, salt, alcohol, vinegar, lactic acid), salted mirin (water, dextrose, rice, corn syrup, salt), garlic, ginger puree (ginger, water), toasted hulled sesame seeds, corn starch, toasted sesame oil, soybean oil, brown sugar, rice vinegar, lime juice concentrate, sea salt, spice.